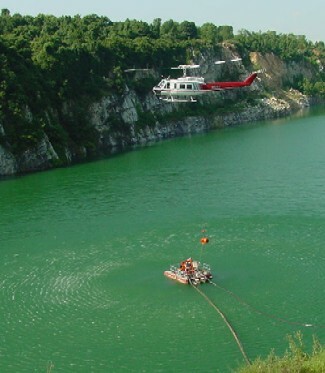 In August of 2003, Godwin Pumps and Agrotor Air Services of Gettysburg, PA were called on to swap a shorted 150 horsepower electric motor from a customer owned HL6M Dri-Prime pontoon pump located in a Pennsylvania quarry. The HL6M pump was struck by lightning causing the motor to short out. Having to meet a fall out requirement of 2 mgd in the quarry, the owner, a commercial real estate developer, had to have the new motor installed as quickly as possible. 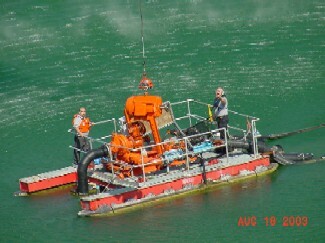 Due to the steep quarry walls, dismantling the electric supply and discharge piping, and docking the pontoon so a forklift or boom truck could reach the motor were not options. A Godwin Pumps electrician worked directly with Agrotor Air Services to airlift the shorted motor off the pontoon and drop the new 1630-lb. motor in place. After two hours, the job was complete and the pump was up and running.